Homemade pizza dough: When that pizza craving hits, skip the delivery and EASILY make your own pizza dough at home! With enough dough for 2 large pizzas, all this recipe needs is a bunch of your favorite toppings to make it the best pizza night ever! I really couldn’t tell you why it has taken me so long to set aside a few minutes to snap some photos of this homemade pizza dough. I mean, I’ve been making this recipe for oh, I don’t know, almost 5 years? I’m still using my original print-out from the pre-iPad days and it has definitely seen its day! And what I love most about this pizza dough is how it turns out perfectly every single time I make it. Not kidding – every single time!! After 1 ½ to 2 hours of proofing, you’ll end up with a warm and slightly sticky dough but it’s a dream to roll out. This is an issue I’ve found to be a problem with a few of the other homemade pizza dough recipes I’ve made in the past. Tough dough is nearly impossible to roll out! 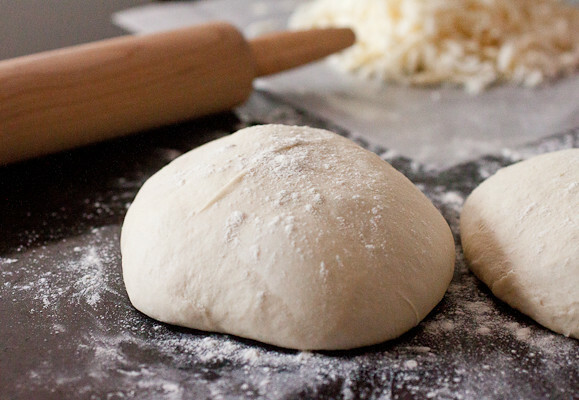 If you’re going for a thin crust, you’ll want to roll this dough out pretty thin. Or, leave it on the thicker side for a beefier pizza! We’ve made pizzas for both the oven (without and without a pizza stone) and for the grill with this recipe and both ways, the pizza turns out spectacularly! I’m sure this homemade pizza dough would be just as great for a skillet pizza as well. Now is the time to get over your fear of yeast recipes and get your hands all floured-up because this homemade pizza dough recipe is way easier than you would think. And I guarantee that it’s one you’ll keep in your recipe arsenal for years to come. This dough yields enough for 2 14-inch thin crust pizzas. If you don’t need this much pizza in your life, you can freeze half of the dough and thaw it in the fridge when the homemade pizza craving hits again. 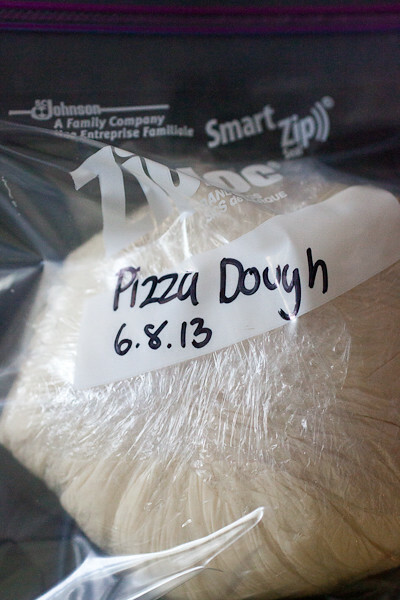 See Step 4 of the instructions below for how to freeze this homemade pizza dough. In a 2-cup liquid measuring cup, measure the warm water. Sprinkle the yeast over the water and set aside. In the bowl of a stand mixer fitted with the paddle attachment, combine the flour and salt. Add the room temperature water to the warm water and with the mixer on low, pour the water into the flour. Add the olive oil. Mix until the dough just combines and starts to pull together. Swap out the paddle attachment for the dough hook and knead the dough on low speed (2 or 3 on most mixers) for 5 minutes. The dough should be smooth but slightly sticky. If it’s too sticky, knead in a couple tablespoons of flour. Very lightly grease a large bowl or dough bucket with oil. Transfer the dough to the bowl, cover tightly with plastic wrap, and let the dough rise in a warm spot for 1 ½ to 2 hours or until it has doubled in size. Transfer the dough to a well-floured surface, divide it in half, and roll each half into a ball. Allow each dough ball to rest for 10 to 30 minutes (no more than 30! ), covered with a damp cloth or a piece of plastic wrap (the one you used to cover the bowl works fine). At this point, you can use the dough right away or wrap it in a double layer of plastic wrap, toss it in a quart-size freezer bag and freeze it for another time. Thaw the dough in the fridge overnight before using. 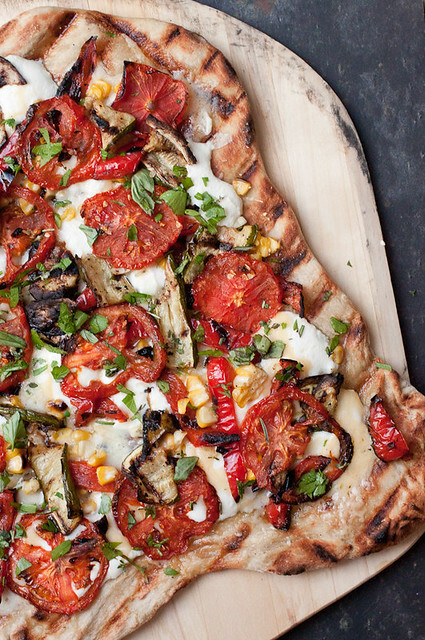 Homemade pizza dough is so amazing, your recipe def. looks awesome! I’ve been wanting to make pizza at home from scratch for a long time. Thanks for sharing this recipe! Try a thin crust. Spread the dough, apply sause and toppings and then roll like a jelly roll. 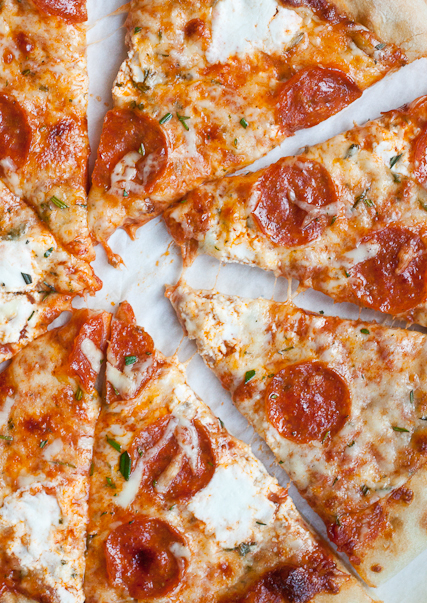 Slice in 2″ pieces. Place upright and bake 450 for 12 – 15 min. The dough came out so good and made the prettiest pizza. I do have a dumb question. I froze half for later. Do I need to thaw out the dough or will it be pliable out of the freezer for immediate use? You’ll have to let it thaw first. It takes a couple of hours at room temperature or a full day in the fridge. So glad you liked it!